The best college for you is not necessarily the most prestigious or the highest rated one. 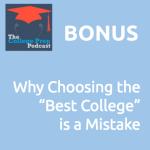 Instead, there are a number of other factors that help students find the perfect college for YOU. Listen in as Megan and Gretchen explain more.